You know, sometimes you can find exactly what you’re looking for on the internet. Other times you’re sent on a treasure hunt where you find completely conflicting information. 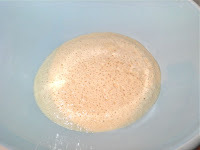 Whey use in breadmaking falls into the latter category. As someone said on a message board on www.thefreshloaf.com (go to it if you love bread): “a lie is halfway around the world before the truth gets its boots on.” There seems to be quite the discussion about what whey actually does when used in bread. The yeast really kicked in. Whey is the greenish liquid leftover from making cheese. In my case it’s left over from chèvre, goat’s milk cheese. Don’t confuse it with whey concentrate or whey powder. Whey has protein so some people were saying that it would make your bread tough. Others argued that the amount of protein remaining in the liquid was insignificant. I’m in their camp. You can use milk in bread, which still has all the fat and protein, so why would whey all of a sudden be more? All I can do is speak from my personal experience. I like whey bread. The bread rose like there was no tomorrow. We keep the house at about 18°F so it’s not like the temperature was extremely high. First rise took 2 hours to more than double. 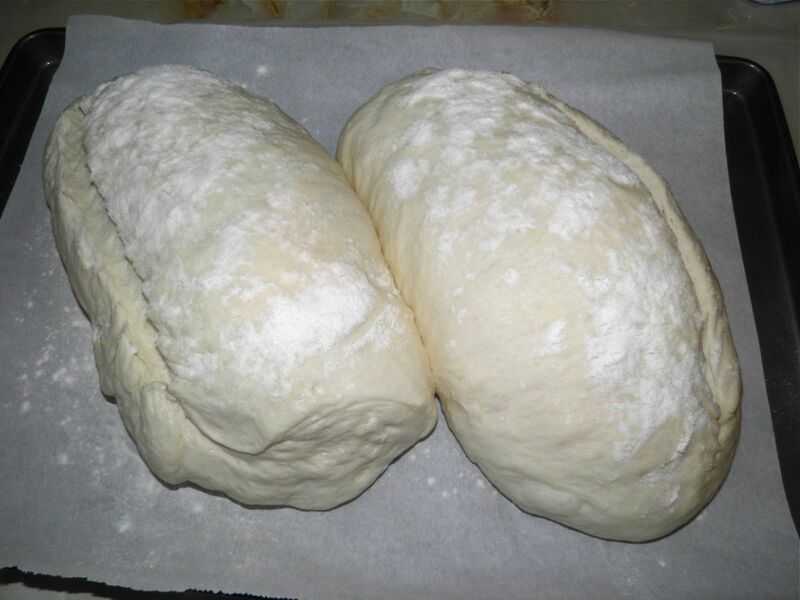 I could have shaped for second rise even earlier. The bread felt very soft and lovely under the hand while kneading and was very easy to shape into cylinders for second rise. It started out sticky but soon came around. 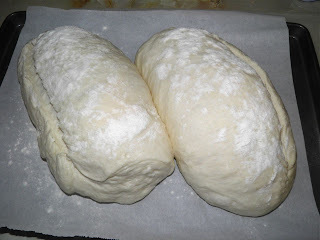 The end result was two “sturdy” loaves (no large holes like French or Italian loaves) like all good farm breads. The crust was soft and a nice chestnut brown. I’m hoping that using the whey will extend the shelf-life somewhat. Whey is used as a natural preservative. So far so good. I made this bread four days ago and it’s still as fresh as the day it was made. This was a great use for a by-product that many people pour down the sink. If you make your own cheese, or drain yogurt to make it firmer, never throw the whey away. It’s liquid gold. It has a thousand uses. Just look it up. Send yourself on a treasure hunt! After first rise, ready for second. Warm the whey in a saucepan to 110°F. Place in a bowl. Stir in the sugar and yeast. Let the yeast proof until bubbly and creamy. Mix together and then turn out onto a flat surface to knead. Place the handful of flour to one side. Flour your kneading hand and throw a little under the dough. Easily doubled again after 1 hour. Vigorously knead the dough for about 5 minutes, flouring your hand and throwing a little under the dough as necessary to avoid sticking. 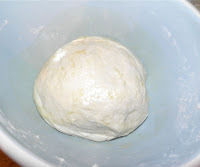 The dough will be very soft and still quite wet, almost sticking to your hand. Do not add too much flour. Be frugal with it. Oil a bowl and then turn the dough into it, rotating to oil the top. Cover tightly with plastic wrap and then a tea towel. Place in a warm spot and let rise for 2 hours. 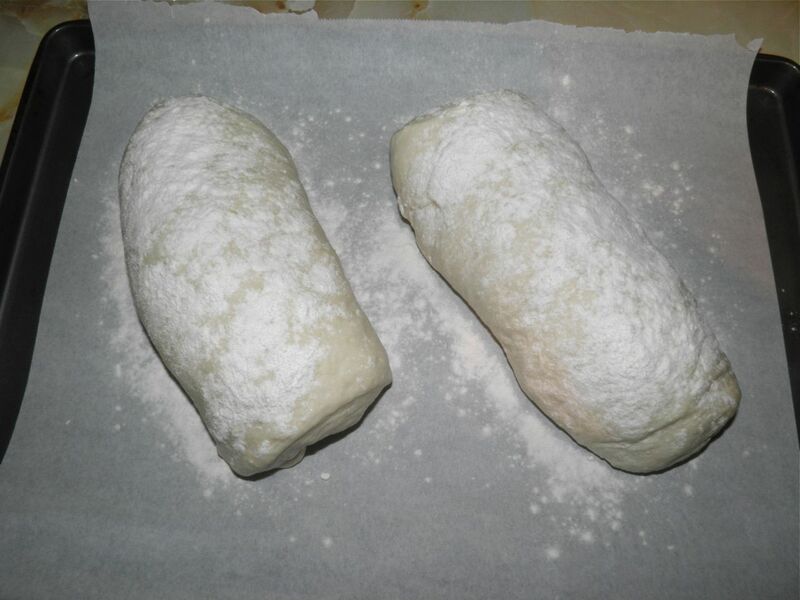 Divide the dough in two and shape into oblongs. Do this by cutting in two and then using your hands as if you were rolling up a towel. The loaves should be about 10” long. Let rise again for 1 hour. Preheat the oven to 475°F with a tray of water on the bottom rack. Just before baking, slash each loaf down the side to about 1/2 inch deep. Dust the top of each loaf with flour. Bake for 30-40 minutes, removing the tray with water after the first 10 minutes. 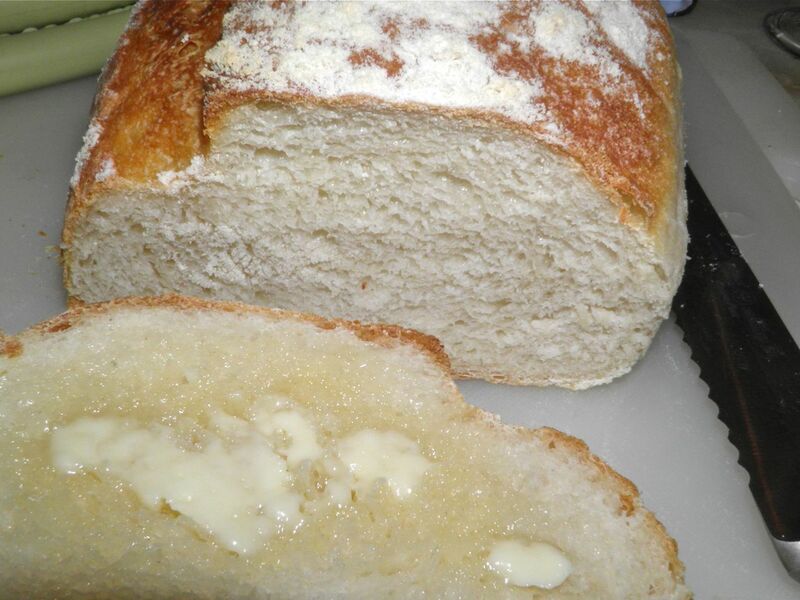 Bake until golden brown and the loaves sound hollow when tapped on the bottom with your fingers. 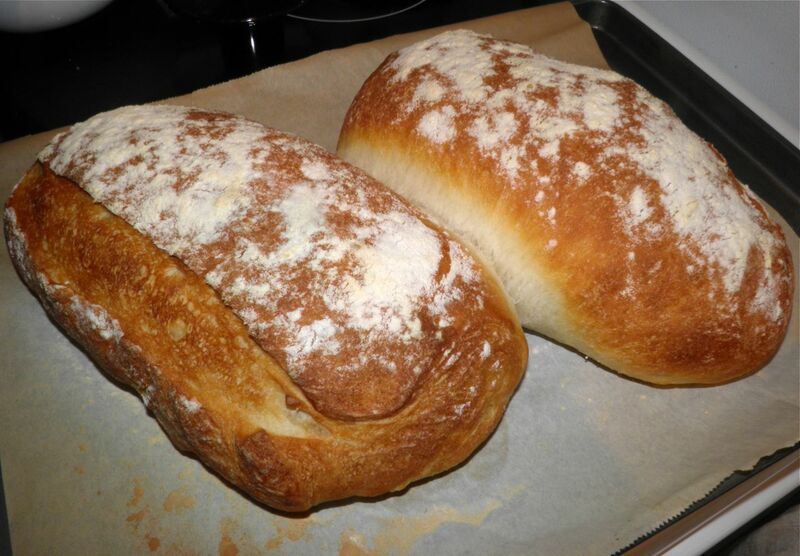 Two easy loaves – enough for a family for a few days. * I made chèvre earlier in the day so had about 3 cups on hand. Chèvre’s easy to make. See recipe here.